An Ohio woman walking on an old but still active railroad trestle in east Louisville was apparently investigating a local urban legend with her boyfriend when she was hit and killed by a train, a deputy coroner said Sunday. Roquel Bain, 26, of Dayton, Ohio, died of multiple blunt force injuries suffered in the collision and subsequent fall from the trestle, Deputy Coroner Jack Arnold said. The collision, which occurred near the 3100 block of South Pope Lick Road, was first reported to police at 7:30 p.m. Saturday [April 23, 2016]. Arnold said Bain and her boyfriend were visiting Louisville to take a “haunted” tour of the Waverly Hills Sanitarium. 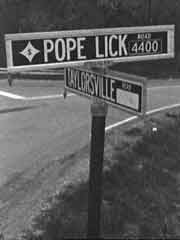 Before their tour started, they heard about the “Pope Lick Monster” myth. Curious, the two made their way up to the train tracks when the train surprised them, the man told the coroner. The man said that the two realized they couldn’t make it to the end of the trestle so they decided to hang off the sides, but Bain couldn’t move fast enough. 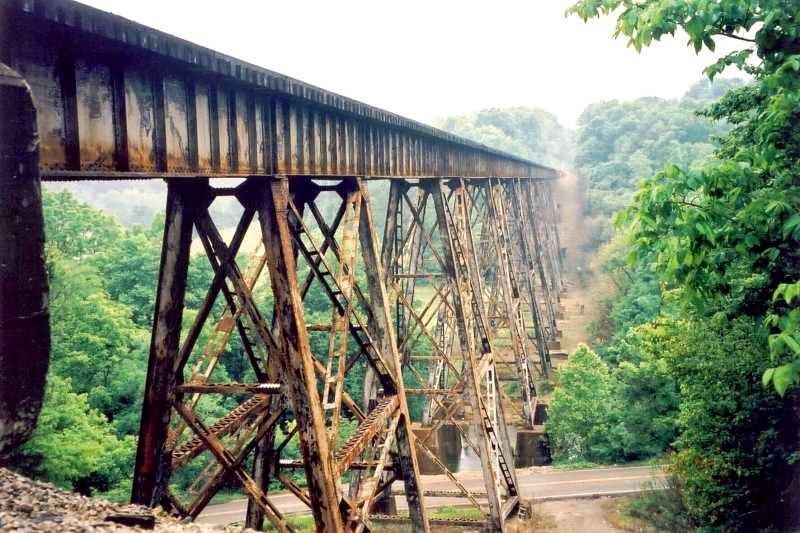 Many thrill-seekers mistakenly think the trestle is no longer in use, author and historian David Domine told WAVE 3 News for a story in 2014. They are drawn by stories of a creature – half-goat and half-man – that tricks people into climbing onto the trestle. A chained fence and warning signs are in place to keep people away from the area. “It’s a very dangerous location,” Domine said. The LMPD Homicide Unit is handling the investigation. The train involved is a Norfolk Southern train. Funeral arrangements for Bain are being handled for Jones, Kenny, Zechman Funeral Home in Dayton. The Pope Lick Monster is/was, according to legend, a half-man, half-goat creature that lives under the Norfolk Southern Railroad trestle across Pope Lick Creek and South Pope Lick Rd. near Fisherville in eastern Jefferson County, Kentucky. The stories have been used as a 'dare' that required an unfortunate sap to climb onto the trestle. These individuals were most likely under the influence of alcohol or drugs. Other legends explain the creature’s origins, including that it is a human goat hybrid, and that it was a circus freak who vowed revenge after being mistreated. In one version, the creature escaped after a train derailed on the trestle. Another version claims that the monster is really the twisted reincarnated form of a farmer who sacrificed goats in exchange for Satanic powers. Nobody knows when the quiet, rural area beyond Jeffersontown first became home to the community’s strangest, and definitely scariest, resident – the Pope Lick Monster. 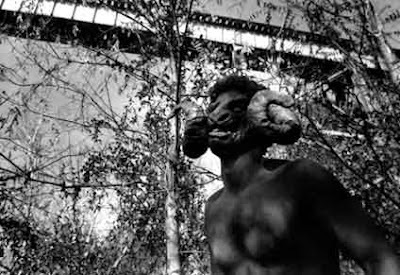 But tales of the creature, also known as the Sheepman, have circulated for decades in eastern Jefferson County, and as Halloween night approaches, rumors of the beast again seem to be common. There are probably as many residents of J-town as there are descriptions of the "thing" that supposedly lives below the rusty train trestle that passes over Pope Lick Road and Pope Lick Creek out Taylorsville Road near Fisherville. Most describe the monster as a scary half-man, half-sheep, who terrorizes anyone who dares enter his domain. They say he has the features of both man and sheep, with horns, an ugly snout and a hairy brown body. He walks upright, has hooves for feet and can run at high speeds, enabling him to catch anyone in his territory. Some say it is Jefferson County’s version of Ichabod Crane’s nightmare – a headless horseman-type monster who rides the tracks and kills anyone who crosses his path. Others say it’s not a monster at all; it’s an old chemist who became a recluse after a chemical explosion in his lab terribly disfigured his face. Others say it’s just a hermit who lived in a nearby shack and would scare away anyone who came near the trestle. Still others say the figure that purportedly wanders the area is the deformed son of a local farmer, so hideous he won’t show his face until nighttime. But whatever the description, the J-town monster has several similarities with other world-famous beasts. Like the Loch Ness Monster and Bigfoot, actual sightings of the Pope Lick Monster have been few and far between, if at all. And like the Swamp Thing and the Creature from the Black Lagoon, the J-town monster has even been the focus of his own local flick, titles “The Legend of the Pope Lick Monster,” which premiered in Louisville in the fall of 1988. The 16-minute, black-and-white movie has been shown at the Vogue, The Uptown and, most recently, at the Water Tower, and been well received by area fans. Half the apparent appeal has been the imposing train trestle, which has stood overlooking the area since 1929. The trestle, which is still used regularly today, spans nearly 800 feet and is about 100 feet tall. Over the years, teen-agers have been known to frequent the location in search of a remote spot where they could party without being bothered by police or parents. While the site may have provided fun for some, tragedy has also come to many who have walked the tracks. In recent years, several youths have been killed, whether from falling from the trestle or after being caught on the tracks and hit by a train. About a year ago train officials put up a chain link fence with barbed wire to keep thrill-seekers from climbing to the tracks. But that hasn’t stopped the rumors about the monster. Also finding the area spooky was Zettler, one of the high schoolers who with a couple of friends made the trek to the monster’s purported stomping ground. As long as the legend has been told, no one knows for sure how it started. And the legend still exists in the East-End community today, but only to a degree.